I’m in such a funny mood. I feel like I want something good to happen. I want to hear some good news. I half feel as though I even expect something good to happen. Some unspecified good thing, which I really couldn’t name. Sometimes, as I go about my day, I’ll think of something that makes me happy. And then moments later I’ll forget the specific thing I was thinking of, but the feeling will remain. And then I’ll go back and try to remember the one specific thing, and in the process of remembering I’ll think of all sorts of things that could make me happy. It feels a little like that. Hopeful, but a tad disgruntled, too, and just a little impatient. Do you ever feel like this? I think I know what this mood is called. I think it’s called, “spring.” And while I’m waiting, I’ll just make some nice meals and share them with my family, and maybe eventually I’ll realize that’s the good thing. This meal involves wrapping a version of choux pastry around a savory concoction, and then baking it till it gets a little puffy. It’s a little bit less eggy than regular choux pastry, so it doesn’t get quite so puffy, but it is lovely and tasty and tender. Wrapping anything in raw choux batter is fun but a little messy. It’s not like you can roll it out and keep it tidy. It’s a sticky sort of batter, but if you keep your fingers cool and damp, the batter won’t stick to them too much, and you should be able to make a relatively even coating. The filling we used was roasted mushrooms, toasted pecans, steamed chard, fresh sage and smoked paprika. Even Isaac liked it! The other day, when I was telling you about all my clever ways to use a medley of herbs and greens from the garden (in this tart, for instance), I mentioned that they were also good with potatoes. 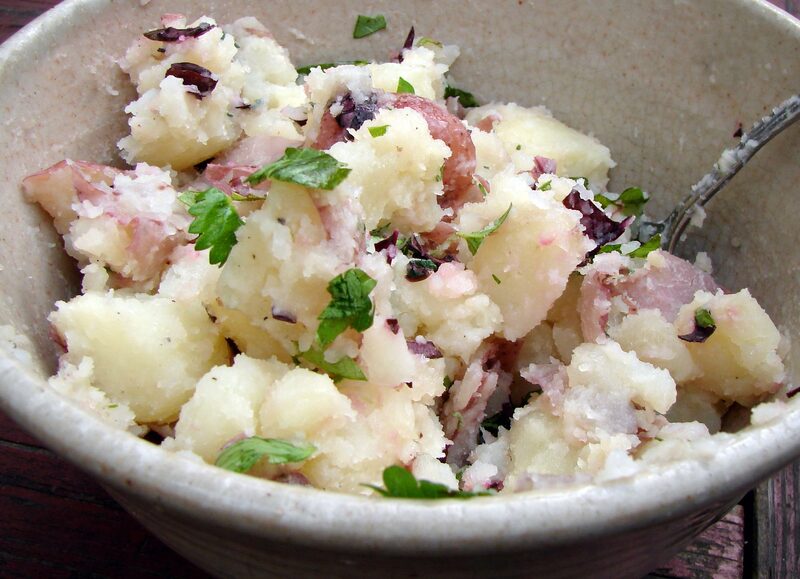 Well, I bought a few new herbs and greens yesterday to plant in the garden, so I thought I’d show them off by mixing them with some boiled chopped red potatoes. I mixed in salad burnet, chervil, lovage, several kinds of basil, summer savory, thyme and bulls blood baby beet leaves. I always boil my potatoes just a little too much, because I’m easily distracted, but I like them that way – almost smashed. The mildness of the potatoes is a nice background for the spicy herbs. Here’s The Violent Femmes with Good Feeling. They remind me of being a teenager, when I felt like this all of the time! Combine everything in big bowl. Mix well, set aside while you make the choux pastry. In a medium-sized saucepan, bring the water, salt, and butter to a boil. Remove from the heat and stir all of the flour in. Try to make it nice and smooth. Beat the eggs in, one at a time. Lightly butter a large baking sheet. Using a large spoon, put 6 large glops of dough on the sheet, evenly spaced and a few inches apart. I think you’ll be using a scant half cup for each glop. You want to have about 6 tablespoons of batter left in the pot to make the tops. Using your spoon or cool damp fingers, make each glop of batter into a bird’s nest shape. Shallow in the center, with thicker edges. Like giant jam print cookies. Divide the filling into six even parts, and roll each bit of filling into a ball. Drop one in the center of each nest of dough. 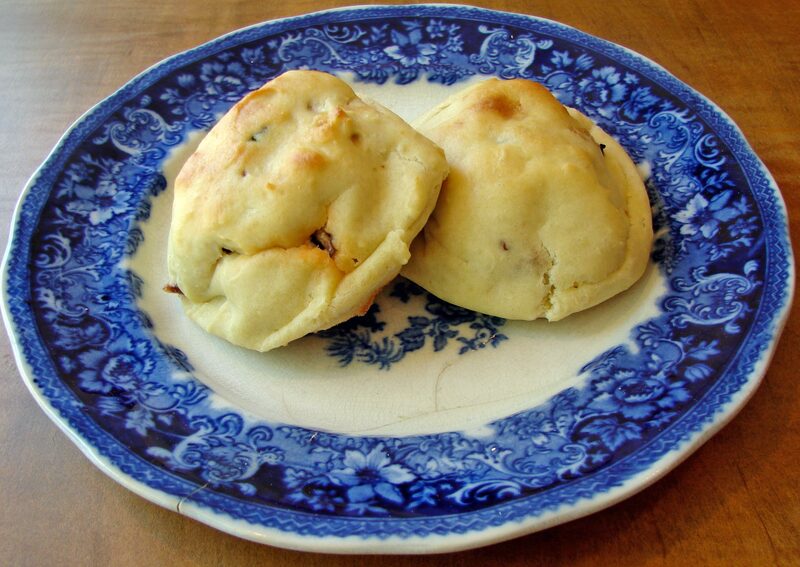 Put a dollop (about 1 tablespoonful) of dough on the top of each ball of filling. Using cool damp fingers, bring the dough from the bottom up the sides of the ball of filling to meet the dough on top. Smooth everything over. (It doesn’t have to be perfect, lumps will work out as they cook). Repeat for each dumpling. It’s a little tricky and mess, but it can be quite fun, too! Bake at 425 (preheated) for about 20 minutes, till they’re starting to turn brown and puffy. Wash 4 or 5 medium red potatoes. Drop into boiling water and boil till they’re just soft when you stick a knife in. Let them cool till you can handle them, and then chop them into chunks – skins and all. Mix in a few tablespoons of butter, plenty of salt and pepper, and any combination of fresh herbs and baby greens you like. Everything you have in your garden!! This entry was posted in basic pie filling, crust, potatoes, recipe, Uncategorized and tagged chard, herbed smashed potatoes, pecans, roasted mushrooms, sage, savory choux, smoked paprika, stuffed choux by Claire. Bookmark the permalink.